The "Bug of Light Wriggling in the Dark". Stage 1 boss of Touhou's Imperishable Night. 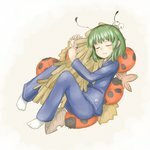 A youkai insect (in her case, based on a firefly) with the ability to manipulate insects. She is best known, however, for the confusion surrounding her gender (due to her androgynous appearance) prior to the full release of IN. Doujins portray her as a member of Team 9, a posse of low-tier Touhou characters alongside Cirno, Mystia Lorelei and Rumia. Also humorously called "G" (short for "gokiburi", Japanese for "cockroach"), due to the antennae on her head. She is also frequently associated with Kazami Yuuka, because they have similar hairstyles and because bugs pollinate flowers.